Little girls are crazy about princesses! With Princess Tea, party-planning parents of their own little princesses can pull together eight different enchanting tea parties. Vibrant color photos provide inspiration, and brief instructions make simple crafts, decorations, and dainty edibles easy for anyone to accomplish. From Lotus Princess Tea to Cowgirl Princess Tea, each themed party is paired with recipes for tea, snacks, and dessert. Fairy Princesses can make their own magic wands, while Underwater Princesses feast on Buttered Sea Shells. This fabulous book is full of fun, fresh, and festive ideas to help grandmothers, mothers, and friends host magical parties that a little princess will never forget. Janeen A. Sarlin is a chef/cooking teacher/food writer/owner of Cooking With Class in New York City and Catskill, NY. 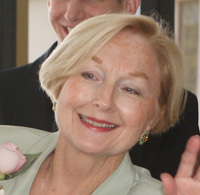 She is a grand aunt and grandmother-in-training who throws many parties. Read More about Janeen here. A Princess Tea Party For Madeline from Janeen Sarlin on Vimeo. TEA SANDWICHES, cucumber triangles plus ham and cheese stars from Janeen Sarlin on Vimeo. Magical Fairy Dusted Brownies from Janeen Sarlin on Vimeo. 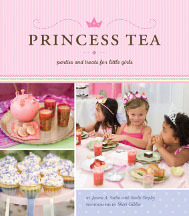 It gives us great pleasure to inform you that Princess Tea has been given the Mom’s Choice Awards® in two categories. This award recognizes authors, inventors, companies, parents and others for their efforts in creating quality family-friendly media, products and services. I’ve created kid friendly recipes for the “Grow the Green” theme on Nickelodeon website and the 2010 Big Green Help toolkit (a resource guide for families, schools, and community organizers). Please check out the healthy and fun recipes inspired by foods that can be bought in farmers markets, organic section of a supermarket or grown in a garden.